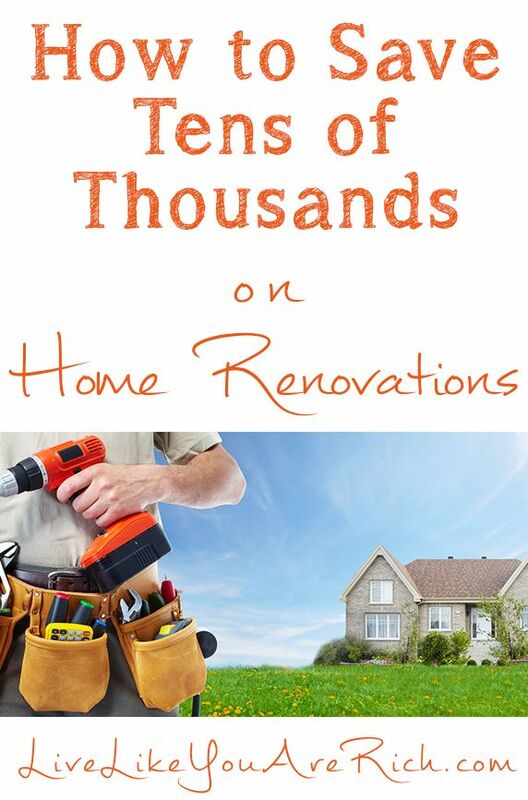 According to houzz.com the average bathroom remodel can range from $3,000 to over $100,000! 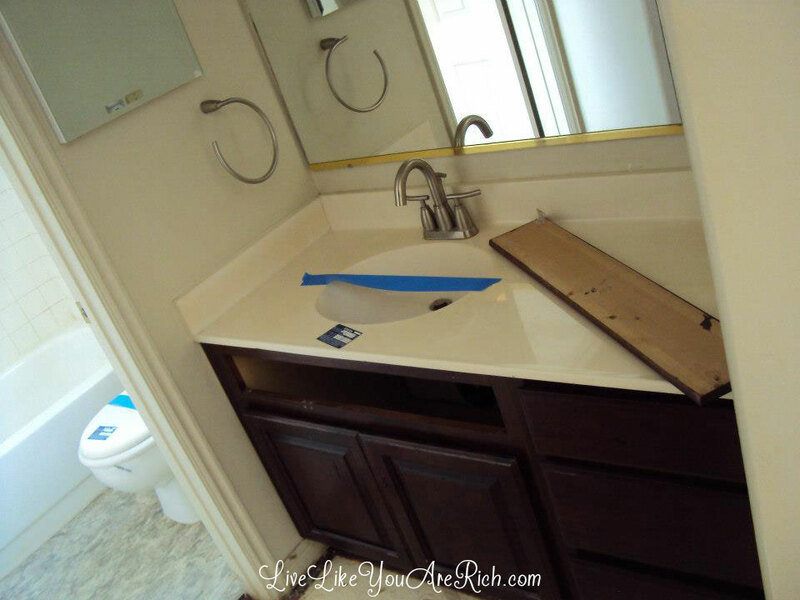 The average inexpensive DIY bathroom remodel is about $5,000. Here’s how we did ours for 10% of that. 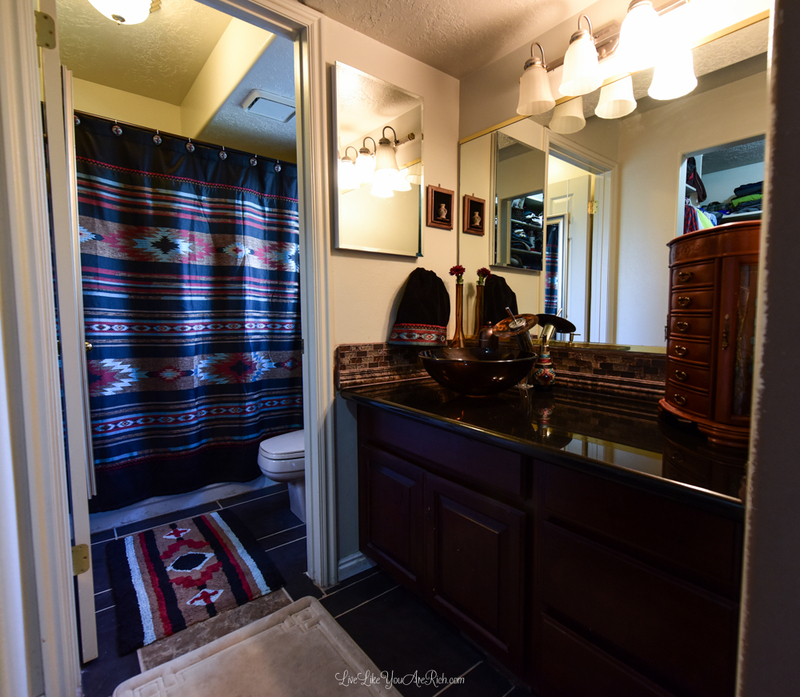 When we moved into our home, there was ugly vinyl flooring, an old toilet and countertop, and the vanity was broken. 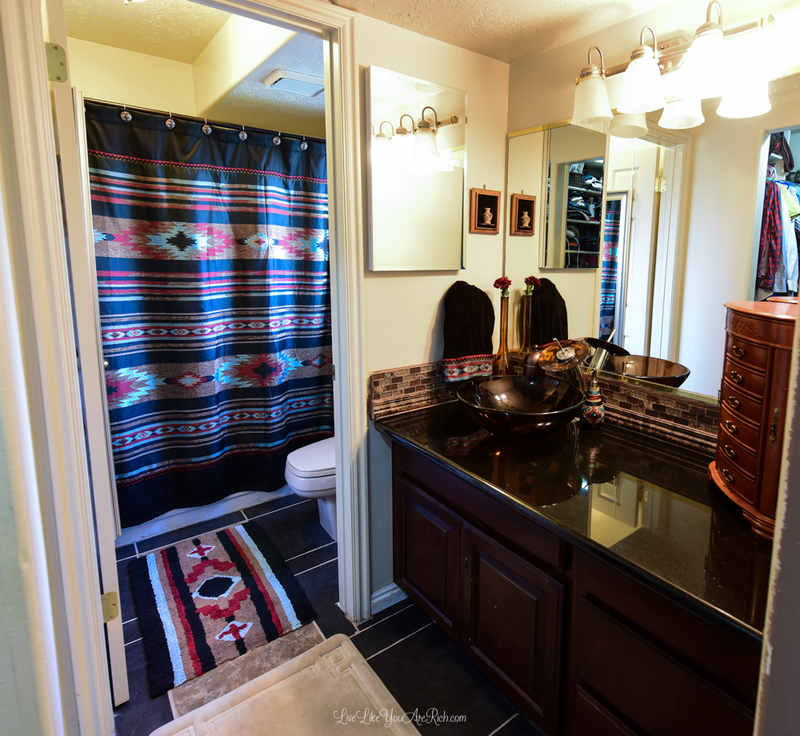 We wanted to continue the Native American theme (from our Master bedroom found here) so I used a lot of patterns and textures that worked together with that theme as we remodeled and decorated. We pulled off the previous counter top off and sold it for $30.00 on the classifieds. Then I found a black granite counter top remnant for $50 and paid another $50 to have the holes cut for the sink and faucet. Net: $70.00. We paid a friend to help with the plumping. Plumbing + parts were $65.00. I bought the new waterfall faucet and bowl sink at a discount store for $75.00. We bought the backsplash, cut, and installed ourselves: $45.00. The framed native pot was free from my grandmother. I bought the vase and fake flower for $5.00 at a discount barn. We bought the Italian tile off classifieds and cut and installed it ourselves. It was an amazing $20.00. We got a steal because she gave us the extra tile she had from a project of theirs. Grout and other supplies: $65.00. We frosted the glass window using frosted glass spray paint (easiest DIY project ever! ): $8.00. 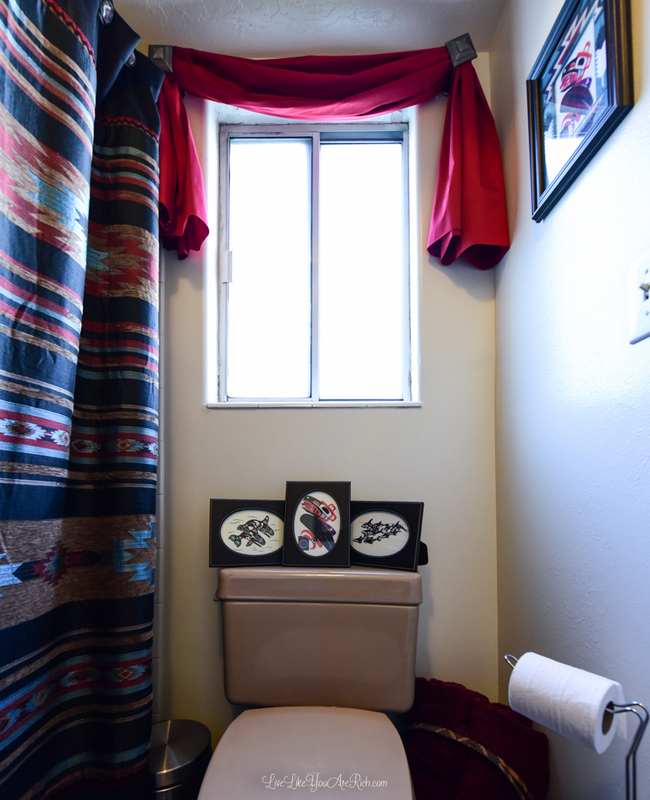 We sold the toilet in the bathroom and brought up an existing one from the downstairs bathroom: <$10.00>. Shower rod was found on Amazon: $11.00. Shower curtain, curtain rings, rug, hand towel, soap dispenser: $80.00 (after use of coupons at JCPenny). Alaskan Native art was bought while we were in Alaska. It was a pack of cards that I framed: $27.00. The frames were $1.00 each at a garage sale and two were gifts: $6.00. Tip: Use electrical tape or duct tape on the backs of frames to prevent moisture from seeping through. Paint was from Sherwin Williams (with coupon): $30.00. Small step trash can with lid is found on Amazon: $20.00. Basket holding towels was found at a thrift store: $1.00. Valance was simply a few yards of fabric draped over the window: $7.00 with coupon at JoAnns. Tie backs doubled as valance holders: $2.00 at a garage sale. The shower’s tile is still nice, the tub was in great condition, and the lighting worked well so we didn’t have to replace those items. So for just over $500 we were able to almost completely remodel, paint, and decorate our bathroom. 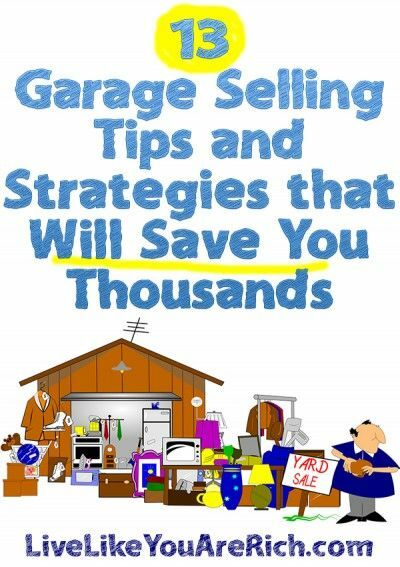 Don’t miss my garage selling tutorial on how to save thousands garage selling efficiently here. For other ‘rich living’ tips and DIY projects, please subscribe, like me on Facebook, and follow me onPinterest. Linked up at Tatertots & Jello. Great job! We literally just repainted our bathroom today and it looks sooooooo much better. It’s like a new room. Who knew that a lick of paint could change the entire feel. Yeah I agree! a new coat of paint can totally do wonders! Thanks for stopping by! Very timely as I’m ripping apart a bathroom right now! Nicely done with the monster budgeting skills! 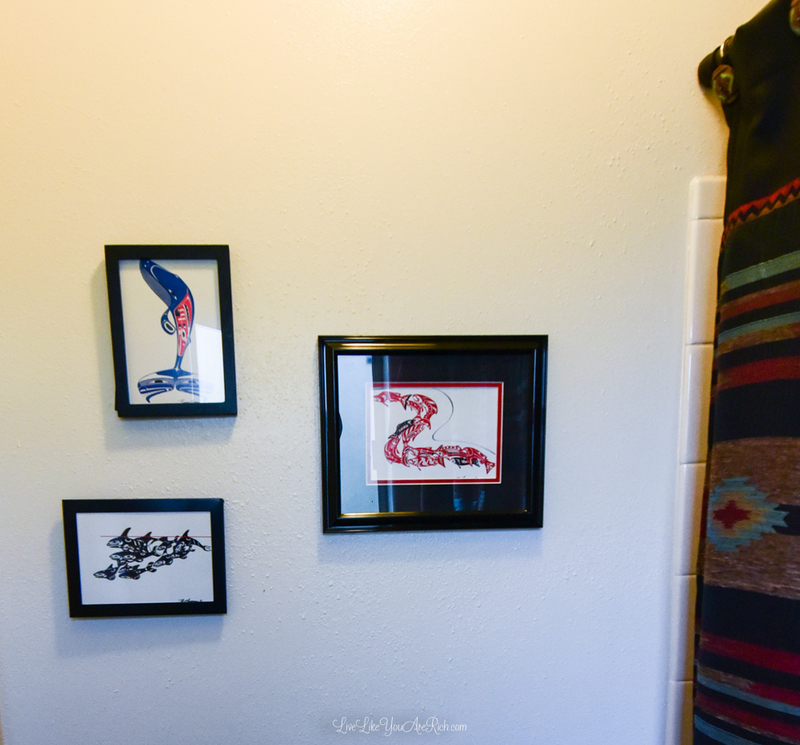 Gives me hope that a bathroom redo and a tight budget can be friends! Oh they totally can. Good luck to you in your endeavors!